The Nikon Coolpix L340's most appealing feature is its 28x optical zoom, and possibly its low, bargain price. For under £120 you get a camera which is capable of taking some good shots, but it relies heavily on you only taking those shots in bright light. If it’s something you’re thinking about for your holiday camera and you think it’s likely you’ll mostly be shooting sunny landscapes and so on, it’s a decent option if you’re on a budget and the optical zoom appeals to you. However, if you’re looking for something to be a flexible all-rounder, it’s reasonably likely that you will be disappointed by some of the shots from the L340. When photographing in low(ish) light, i.e. the fading light on a gloomy day, images tend to lack detail and have a painterly effect. Vibration Reduction doesn’t seem to help too much with hand held shooting at middle-range ISOs, so at times you’ll be forced to use a higher ISO which results in lower quality images. It’s also not the camera for you if you’re looking for something a little more advanced. There’s no semi-automatic, or even Program modes, and while you can change certain settings such as ISO and White Balance in ‘Auto’ mode, some will be left frustrated by the lack of ability to change aperture or shutter speed. Many of the other specifications of the Nikon Coolpix L340 are also pretty basic. The screen is fairly low resolution by modern standards, it can only shoot at 720p HD for video, and there’s no inbuilt Wi-Fi. On a more positive note, those who like the feel of a bigger camera, with a deep grip and fairly large buttons, should find this a reasonably enjoyable camera to use. Using AA batteries is pretty divisive, and you may fall into one camp or the other. It’s arguable that using this type of battery means you can pop into any convenience shop in the world and pick up a new set - handy if you forget your charger or don’t have access to a plug socket. On the other hand, it means an extra pay out for batteries, whether that’s a one off for rechargeable ones, or otherwise. 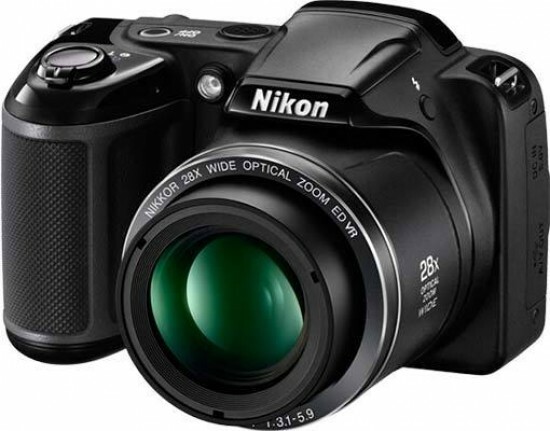 Although the Nikon Coolpix L340 is cheap, there are other cameras on the market, which are similarly priced, that offer a longer focal length zoom. 28x was once groundbreaking, but when other cameras offer 40, 50 and 60x as standard, it’s starting to look a little limited. Still, it offers a good degree of flexibility for most shooting scenarios. Considering that the Nikon Coolpix L340 has only just been released, it’s starting price of £115 will probably go down - once it drops below the £100 mark, it should become even more appealing for those looking for a cheap holiday camera.